Admittedly, many of these pics are of my buddy Glen, but there's plenty of pics of others from the Men's Cat 2-3-4 race (1:00pm). There are low res. If anyone wants one of the pics in hi-res, let me know. There comes a time in a race when you know you're pushing as hard as you can. Your heart rate is at the max, you're legs are pumping, and you can't hear over the rush of blood pounding through your ears. You take a moment to look behind you, and see... no one. At this point, you can glean one of two things. 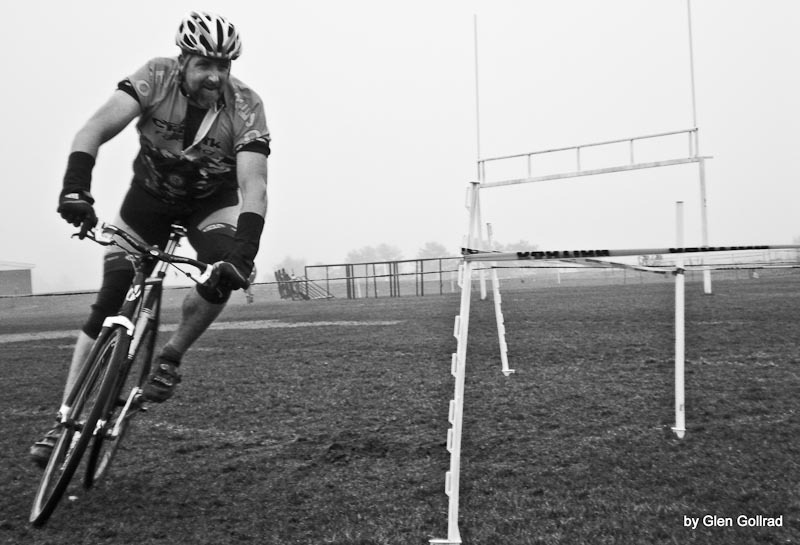 Either you've made a break that no one can match, you're in front and your gap is growing. or, in my case, you know that you're probably in DFL. I wish I could blame my bike-but it was working fairly well. 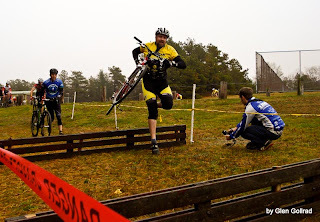 I wish I could blame the course, but it was fast and fun (an no one else seemed to be hindered). I wish I could blame the big crash at the start line, but fortunately, I was in front of that mess, implying that I got a great start (which I did). Nay, blame lies sadly in one spot-that's right, the Spanish Inquisition. Okay, here's how things went down. I picked up my buddy Glen at about 7:00am and made the hour or so drive to Plymouth, MA. In case you didn't know, Plymouth has TWO high schools, so if you plug Plymouth High School into GoogleMaps, you've got a 50/50 shot of getting the right one. As usual, the odds were against me and we arrived at the high school without a single course marker, port-o-let, or person. Incidentally, as this weekend was a two-day race in Plymouth, the race promoters used the north high school for day one and the south high school on day two (which would have been apparent to me if I had read the flyer). 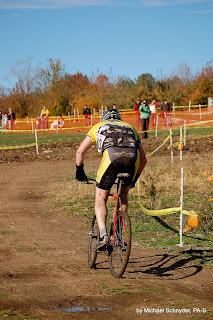 You can imagine our confusion at seeing clear signs of a recent race (tire tracks in the mud), but not another soul. Anyway, after some BlackBerry and iPhone maneuvering, we found the correct location. 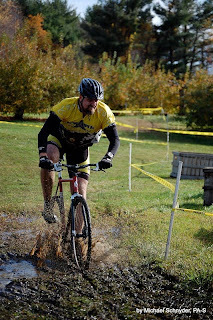 The delay did however give me a simple answer to the question of "should I pre-ride the course?" We got there in just enough time for me to pin my number on, sign my one-day license and find the staging area. 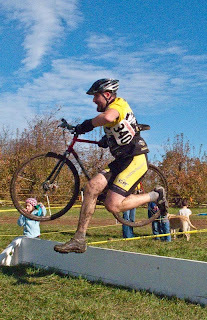 I muscled my ironic flat bar 'cross bike to the start line and within a few minutes, the start whistle had been whistled. 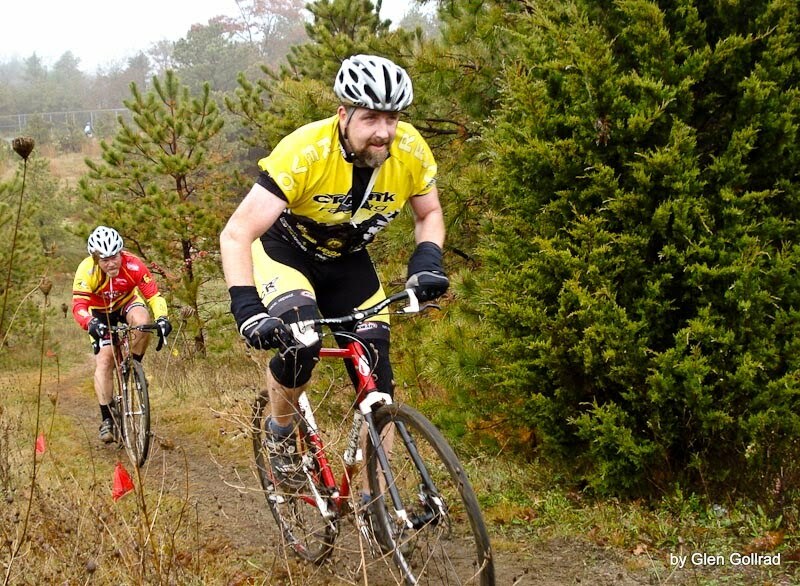 After a few hard pedal strokes I heard the unmistakable sound of knobby tires meeting knobby tires, followed by some crashing. Fortunately, this occurred behind me. Unfortunately, everyone that was held up with that calamity seemed pass me not too much later. 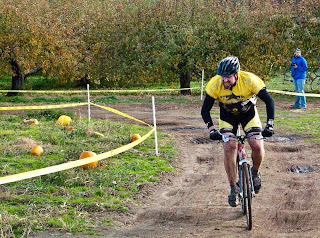 I felt great heading into the woods on the singletrack, but as soon as we hit the huge field of grass, I felt like I was riding on two flat tires. The remainder of the race was mostly unremarkable. I kept up the effort, and pretty much settled in to my approximately 30th place spot. I made sure I didn't lose any spots, but I couldn't seem to bridge up any further... until the final climb up to the finish. 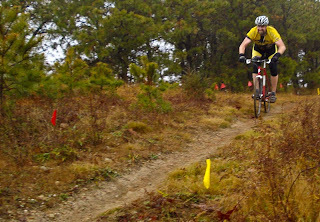 I came up behind another rider that seemed to feel about as fresh as I did (not). I hung in behind him down a slick, off-camber, wet, grassy downhill and put the hammer down on the last climb. I passed him, but then exploded. And I do mean exploded. I honestly don't know what happened. Did my chain skip or slip? Did my back wheel spin out? Did someone shoot me from a grassy knoll? I don't know. But what I do know is that I was suddenly falling face first into a large rock. I was able to keep my pretty face from making contact, but I was totally off my bike, and oddly enough, out of one of my shoes. Needless to say, that guy passed me. 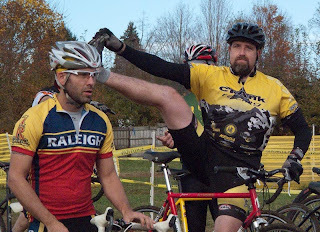 With the reflexes of a ninja, I jumped back on my bike and finished the race doing a one-legged sprint to the line. Check out GPS data from the course here. 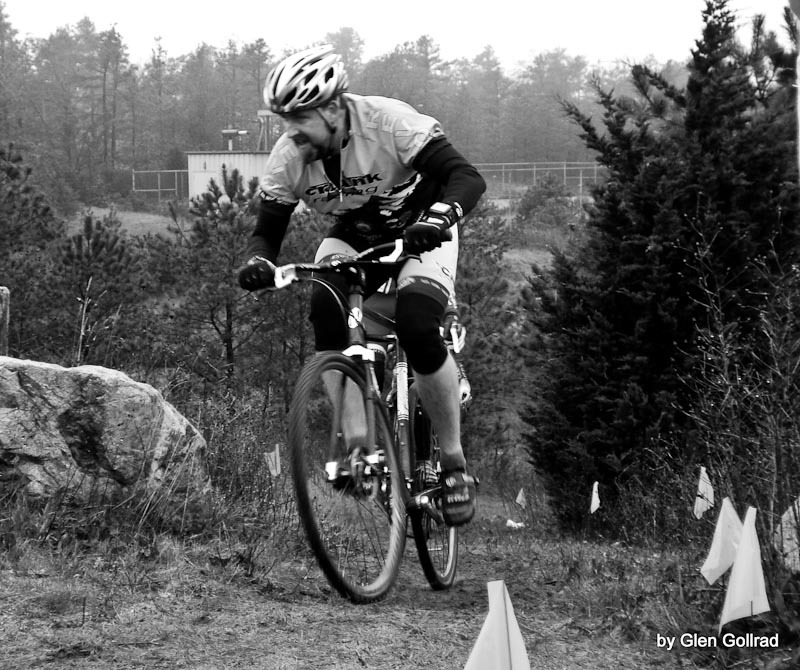 And while I didn't have to wait around for a medal, I did wait around to put another effort out on the course. 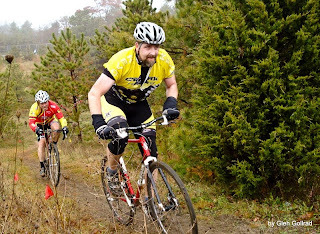 I raced again at noon (this time with my buddy Glen), both in the Master 35+. 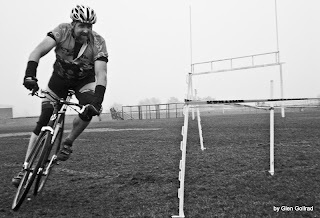 I over estimated my athletic prowess as I was caught by the leaders by the third or fourth lap. I decided to drop out, get cleaned up, and take some pics of Glen's race. All in all, the day was a good beating. That cheeseburger on the way home and the beer later that night tasted so good though! Next up, Sterling, MA, Thanksgiving weekend! 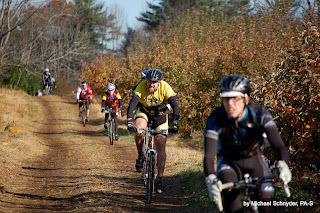 Sunday's event was the first annual Applecrest Farm's Cyclocross race in Hampton Falls, NH. 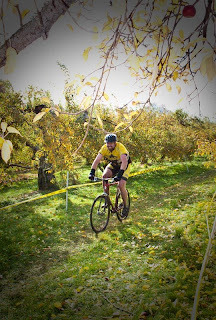 As you can probably guess from the name, the course was on a farm, and we traveled in, out, and through the orchards. 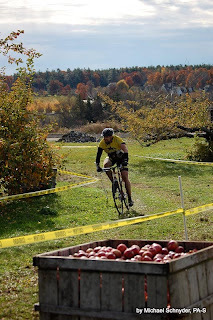 Overall, the course--nay, the entire event--was great. However, I sucked. Want some excuses? Here's one: I started in the absolute back of the pack. Never good. Want another? 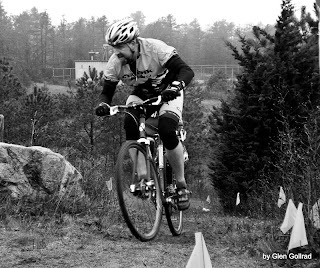 I crashed-- but that didn't slow me down *too* much. No, despite the fact that I slid on my side for a while, and the fact that I started in the back, the ultimate reason I didn't do better was that I'm slow. That's okay--my comprehensive training plan is to allow myself to hit complete rock bottom--in terms of fitness--so that I can ONLY get better. So far, my decline is going exactly according to plan! Anyway, I had fun, and Jean was on hand to yell at me and ring the omnipresent cowbell. Mike and Jo Schnyder were there too--ringing bells and taking pictures--THANKS! After my proverbial spanking, we all went to Portsmouth, NH, for lunch. Mmmmmm, lunch. The next race on the schedule is in Plymouth, MA! 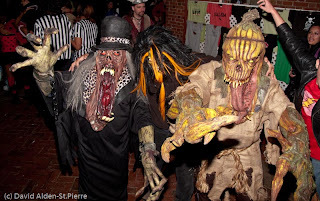 This past Saturday, being Halloween, was a big day here in Salem. And, Jean and I tried to spend as little time in Salem as possible. 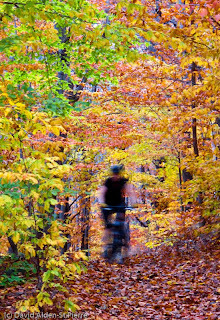 The great weather was a good excuse to spend some time on the trails, and we hit some of our favorites at Bradley Palmer/Willowdale. Now, in recent years, we've had a pretty weak showing for kids coming to the house begging for candy. I figured that this year, we'd skip buying candy altogether (it used to just end up going to work with us). So, when we were driving through our neighborhood, and we saw just under a million kids trolling the streets, I knew I had made an error in judgment. So, yep, in the house with no lights on until they were all gone! I decided to head in to downtown to see how the festivities were going, and I've got to say, it was pretty amazing. I usually stay as far away from the madness as possible, but this year I grabbed my camera and went into the belly of the beast. Being able to roll through traffic on a bike was key. 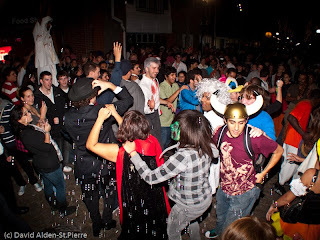 Anyway, the crowds were huge but fairly orderly, and some of the costumes were movie quality. I posted some of the pics on Facebook.